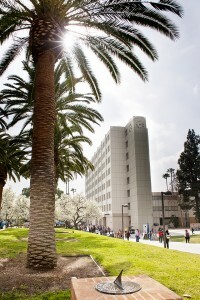 California State University, Northridge is named No. 47 on Sierra Club’s “Cool School” list because of recent strides in sustainability on campus. California State University, Northridge ranked No. 47 of 201 colleges and universities on Sierra Club’s Cool School list due to recent strides in sustainability. CSUN ranked the highest of all of the CSUs and finished ahead of University of Southern California and University of California, Los Angeles. CSUN’s strides in sustainability also earned recognition in the Association for the Advancement of Sustainability in Higher Education’s (AASHE) Sustainable Campus Index based on recent water conservation efforts. “This is the first time we have completed the Sustainability Tracking, Assessment and Rating System (STARS) report, and to be recognized as one of the top two CSUs along with getting ranked 47th in the Cool Schools ranking system is a huge honor for not only CSUN, but for the CSU system as well,” said Austin Ericksson, CSUN’s sustainability program manager. Campuswide water use has been reduced by 22 percent using methods including irrigation improvements and innovations. Eriksson says that students on campus should feel a sense of pride knowing that they attend a university that is doing its part to help reduce its environmental impact on the planet. CSUN has been making viable sustainability efforts in administration, dining, education, energy and buildings, environmental quality, organics, purchasing and consumption, transportation, waste and materials management and water.